Welcome to Summer 2017 issue of the PowerChurch Software newsletter. In this issue, we highlight a handy utility for merging duplicate profiles, backing up and saving files from PowerChurch Online, and our online training videos are on sale through the month of August! It is not uncommon, especially in a multi-user environment, to have duplicates of people in Membership. For example, a profile is added in Membership without an envelope number. The Contributions data entry person doesn't locate the member and adds a new profile for them. Luckily, PowerChurch has a simple utility that will combine two Personal Profiles while retaining their Contributions, Activities, Attendance, and other related information. Since there is not a way to undo this process once it has been done, it is always a good idea to make a backup before getting started. That can be found under Utilities > Backup & Restore. 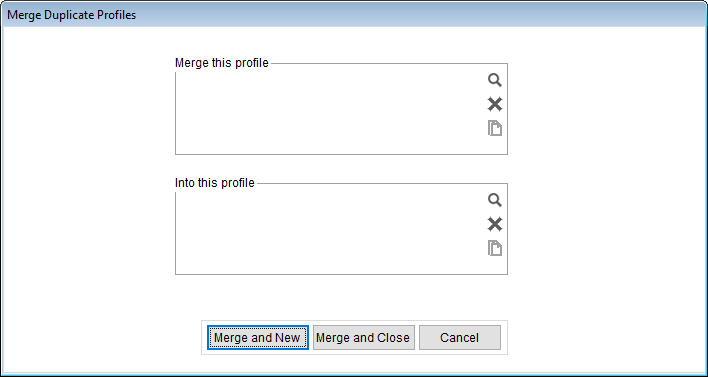 To merge duplicate profiles, go to Membership > Personal Profiles > Setup and choose Merge Duplicate Profiles. The screen is arranged in an easy to understand layout: "Merge this profile into this profile". Before the process can begin, you will need to decide which copy of the person you want to keep. The other copy of the person will be merged into the first. 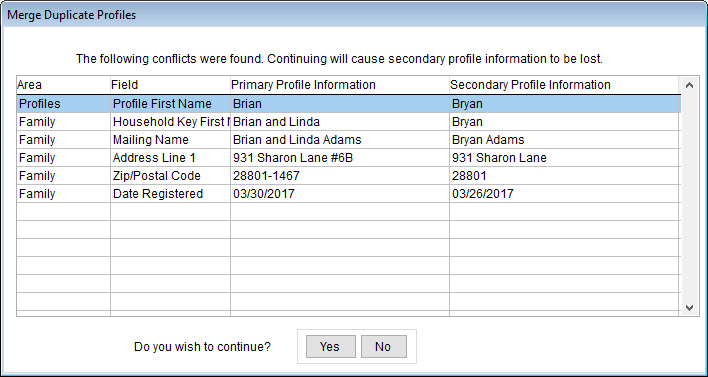 In the "Merge this profile" area, choose the copy of the person you want to be removed. Click the Lookup button (magnifying glass icon) to choose the person from the list. As with all Lookup/Locate lists in PowerChurch, you can begin typing the person's last name and the cursor will jump down through the list as you type. In the "Into this profile" area, choose the copy of the person you want to keep. Click the Lookup button and choose the person from the list. Now click one of the Merge buttons at the bottom of the screen. If you have multiple people with duplicate profiles that you need to take care of, click the "Merge and New" button. 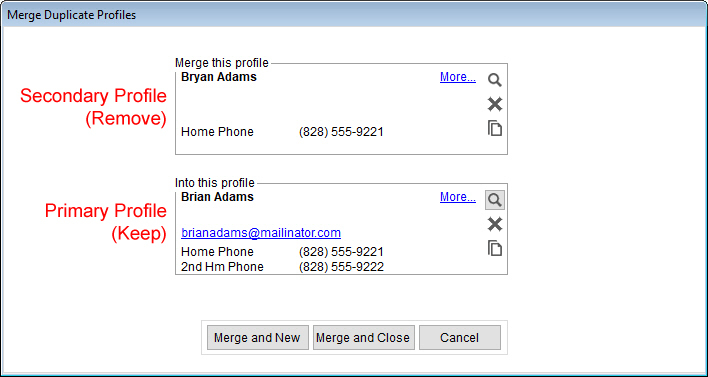 This will merge the selected profiles, then clear the form so you can carry on and merge another. Otherwise, click "Merge and Close". What is detailed here are differences between the information on the primary profile (the one to keep) and the secondary profile (the one to remove). Information listed in the Secondary Profile column will be lost if you continue. As you can see, the address information is actually more complete on the Primary Profile, so nothing of importance will be lost when the merge is complete. If there was more complete or correct information on the secondary profile, you would want to update the primary profile with the new information, or re-evaluate which profile of the two you want to keep. To continue on and complete the merge, click Yes. When the process is complete, all Personal Profile information and related Contributions, Activities, Attendance, and other information will have been moved from the Secondary Profile into the Primary Profile. For any of the conflicts, information in the Primary Profile will be retained. The Secondary Profile will then be deleted from the system. One of the many benefits of using the PowerChurch Online service is that we backup our servers every 30 minutes and copy the backups off-site for disaster recovery purposes. These backups are purely to protect PowerChurch Online users from data loss in the event of some type of system failure or extended service outage. These backups would allow us to spin up new servers in an emergency to get the online service back up and running with a minimal amount of downtime and data loss. Fortunately, in the history of the PowerChurch Online service, we haven't needed to use these backups. However, it is comforting to know we've got it covered just in case! Our backups are not accessible to users, therefore it is highly recommended that you still make your own backups for strategic purposes. If you are about to make balance adjustments in Fund Accounting, or delete inactive people from Membership, it is a good idea to make a backup before getting started. That way, you have the ability to undo the operation if it doesn't turn out how you expect. In PowerChurch Online, you can save backups temporarily on our servers, or download them to your local computer for more permanent storage. From time to time, we clean up the storage drives on our servers, purging older backups. The two latest backups are saved, but older ones will eventually be deleted. When signed in to PowerChurch Online, go to Utilities > Backup & Restore. Choose Backup Files. On the next screen, choose which files to include in the backup, then click Next. Click the Choose Folder button to browse to the location you wish to save the backup file. In the Select Folder window that opens, ignore the links to Desktop, Network, and Libraries, as those are locations on our server that you don't have access to. Under Computer, you will see drives M through Z listed. Drive Z is your shared storage space on our server. Select that and click OK to save the backup file on our server. Drives M and higher are the drives found on your local computer. You should be able to recognize these drives by the name that shows next to the drive letter, like "Client C (M)" or "Client Home (M)". This is the main C drive or Home drive on your computer. If you have a second hard drive or other external devices, like flash drives connected to your computer, you may see drives N and higher listed as well. In Windows, your common locations, like Desktop, My Documents, Downloads, etc. will be found in C:\Users\Your User Name\. Through PowerChurch Online, of course, that would be M:\Users\Your User Name\. The process of saving other files, like report exports, from PowerChurch Online is similar. When you bring a report up on the screen, click the Save As button (floppy disk icon) and choose the file type to save as (PDF, Excel, etc.) The report file will be generated, downloaded to your local computer, and then a window will open asking where to save it and what to name the file. Something important to remember when saving files to your local computer from PowerChurch Online is in most cases, the file extension is not automatically added to the file name. For example, you run a report in PowerChurch and on the screen preview, click the Save As button. You choose to save it as a PDF. When the window opens asking where to save the file, it will have a default file name of PCREPORT. For this to be recognized as a PDF file, you would need to add the ".PDF" on the end of that file name. For the month of August 2017, all of our online training videos are on sale at 20-30% off! Training videos that you purchase will always be available for online streaming and there is no limit to the number of times or number of your staff members that watch them. Visit www.powerchurch.com/training/videos for more information and pricing. Q. We have only the Version 11 disc but we can't find the 11.5 disc. How can we install on a new computer without the latest disc? Q. We have set up Vanco and we are trying to link this with our PowerChurch. In the Setup, it asks for a Contribution Transit Asset Account and we have created a Vanco Payments Detail account. When we plug in this account, it continues to tell us "Transit Asset Account is not in fund." We are quite confused on what this means, and how to remedy the situation. A. That means that you have Contribution Funds set up to affect accounts in other Accounting Funds. The Transit Asset Account needs to be added to all of those Accounting Funds, so that PowerChurch will be able to create a properly balanced transaction. To fix this, go back to the Maintain Chart of Accounts screen, use the Locate button to bring up the transit asset account, then click the Add Account to Fund button and add it to all necessary accounting funds. Q. I am looking to do labels for every family that has a child in the 6-12 grade. What is the best way to do that? A. If you already have these kids assigned to an Activity (Sunday School by year, Senior High youth, etc) you can run the labels from under Membership > Activities & Skills > Print Mailing Labels > Parents of Selected Activities & Skills.